It must be said that it is difficult to stop European clubs from touring Asia, and in this case Malaysia, for promotional activities and pre season training. There is the economic factor and increasing number of fans in the region, thus the demand is there for all to see. Over the years we have seen the likes of Barcelona, Chelsea, Manchester United and Liverpool coming over to entertain the local crowds. It has been successful indeed. It finally boiled over recently after the Malaysian national team’s ranking dropped to it’s lowest ever in the FIFA ranking (166th) and after the announcement of Tottenham and Liverpool’s tour which in many fans’ eyes is a disruption to the World Cup and AFC qualifiers. For one, it was said that a proposed friendly against the Philippines was scraped to allow Tottenham’s game to be scheduled. The disruption has also caused upset among local fans who have seen their money gone to waste (from bus/flight tickets to accommodation for away games) because of the cancelled/postponed local league. We are not a developed nation and money is still considered scarce here. Most of all, it was a mistreatment of national pride. 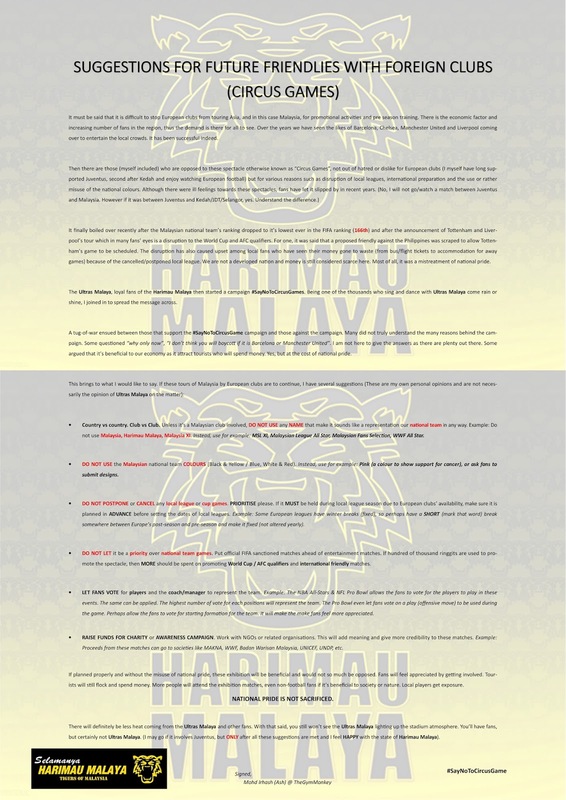 The Ultras Malaya, loyal fans of the Harimau Malaya then started a campaign #SayNoToCircusGames. Being one of the thousands who sing and dance with Ultras Malaya come rain or shine, I joined in to spread the message across. A tug-of-war ensued between those that support the #SayNoToCircusGame campaign and those against the campaign. Many did not truly understand the many reasons behind the campaign. Some questioned “why only now”, “I don’t think you will boycott if it is Barcelona or Manchester United”. I am not here to give the answers as there are plenty out there. Some argued that it’s beneficial to our economy as it attract tourists who will spend money. Yes, but at the cost of national pride. · Country vs country. Club vs Club. Unless it’s a Malaysian club involved, DO NOT USE any NAME that make it sounds like a representation our national team in any way. Example: Do not use Malaysia, Harimau Malaya, Malaysia XI. Instead, use for example: MSL XI, Malaysian League All Star, Malaysian Fans Selection, WWF All Star. · DO NOT USE the Malaysian national team COLOURS (Black & Yellow / Blue, White & Red). Instead, use for example: Pink (a colour to show support for cancer), or ask fans to submit designs. · DO NOT POSTPONE or CANCEL any local league or cup games. PRIORITISE please. If it MUST be held during local league season due to European clubs’ availability, make sure it is planned in ADVANCE before setting the dates of local leagues. Example: Some European leagues have winter breaks (fixed), so perhaps have a SHORT (mark that word) break somewhere between Europe’s post-season and pre-season and make it fixed (not altered yearly). · DO NOT LET it be a priority over national team games. Put official FIFA sanctioned matches ahead of entertainment matches. If hundred of thousand ringgits are used to promote the spectacle, then MORE should be spent on promoting World Cup / AFC qualifiers and international friendly matches. · LET FANS VOTE for players and the coach/manager to represent the team. Example: The NBA All-Stars & NFL Pro Bowl allows the fans to vote for the players to play in these events. 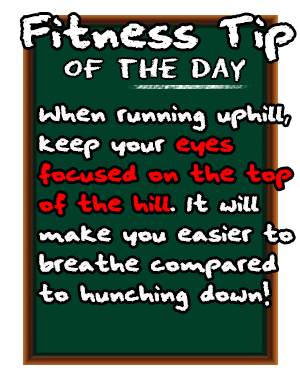 The same can be applied. The highest number of vote for each positions will represent the team. The Pro Bowl even let fans vote on a play (offensive move) to be used during the game. Perhaps allow the fans to vote for starting formation for the team. It will make the make fans feel more appreciated. · RAISE FUNDS FOR CHARITY or AWARENESS CAMPAIGN. Work with NGOs or related organisations. This will add meaning and give more credibility to these matches. Example: Proceeds from these matches can go to societies like MAKNA, WWF, Badan Warisan Malaysia, UNICEF, UNDP, etc. If planned properly and without the misuse of national pride, these exhibition will be beneficial and would not so much be opposed. Fans will feel appreciated by getting involved. Tourists will still flock and spend money. More people will attend the exhibition matches, even non-football fans if it’s beneficial to society or nature. Local players get exposure. NATIONAL PRIDE IS NOT SACRIFICED. There will definitely be less heat coming from the Ultras Malaya and other fans. With that said, you still won’t see the Ultras Malaya lighting up the stadium atmosphere. You’ll have fans, but certainly not Ultras Malaya. (I may go if it involves Juventus, but ONLY after all these suggestions are met and I feel HAPPY with the state of Harimau Malaya).